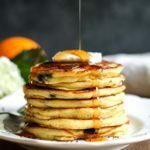 Ricotta cheese makes for the lightest, fluffiest pancakes, with a delicate orange flavor set off with dark chocolate chips. Separate egg whites and yolks; place whites in another clean medium bowl, and place yolks in a large bowl. Add the ricotta, milk, orange zest, and orange juice to the large bowl with the yolks and whisk together until smooth. Stir the dry ingredients into the large bowl with the wet ingredients until just combined and a smooth batter is formed. Do not over-mix. With a hand mixer, or stand mixer with the whisk attachment, beat egg whites on medium to high speed until stiff peaks form, 3-5 minutes depending on the speed (for photos of what stiff peaks look like, see this post). Fold the egg whites into the batter with a spatula gently until there are no streaks of white. Fold in the chocolate chips. Heat a griddle pan or frying pan over medium heat. Grease the pan with butter, then drop batter by 1/4 cup measure per pancake. Spread the batter out a little with the back of the measuring cup. Cook 4-5 minutes on the first side, then flip and cook 2 more minutes or until golden. Remove to a large plate. Repeat with the rest of the batter until no batter remains. Serve with butter and maple syrup! Recipe adapted from my Lemon Ricotta Pancakes with Blackberry Sauce.